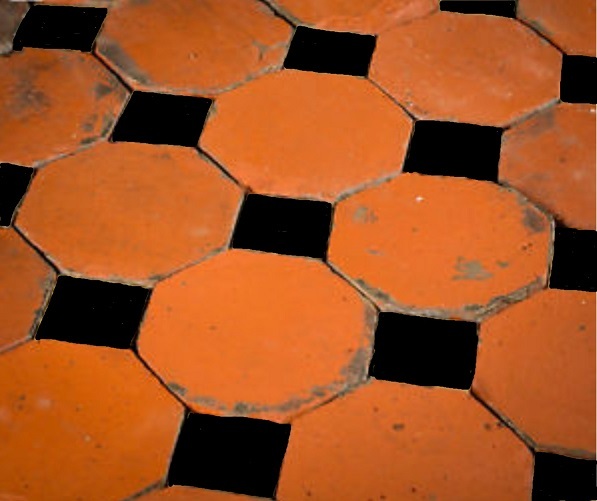 The octagon and its tessellating square was a popular design in tiled floors as well as quilts – the kitchen floor in my last (Victorian) house had such a design with terracotta octagons and black squares. 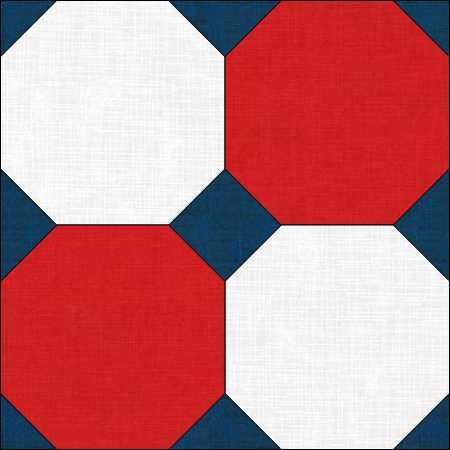 In Hannah Hauxwell’s collection of quilts was a red, white and blue one made from large octagons and squares. 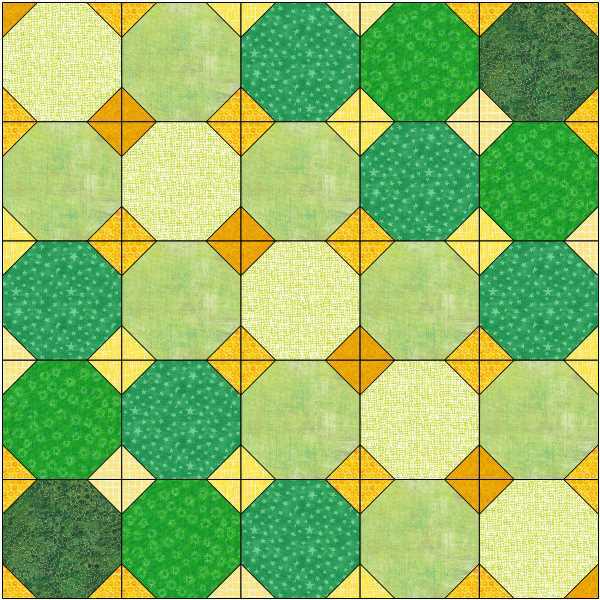 This looks to have been made with simple (true) octagons and squares rather than the way we might do it today, which is to rotary cut squares and then replace the corners with a triangle of another colour – a Snowball block in other words, usually based on either a 4-patch or a 9-patch. 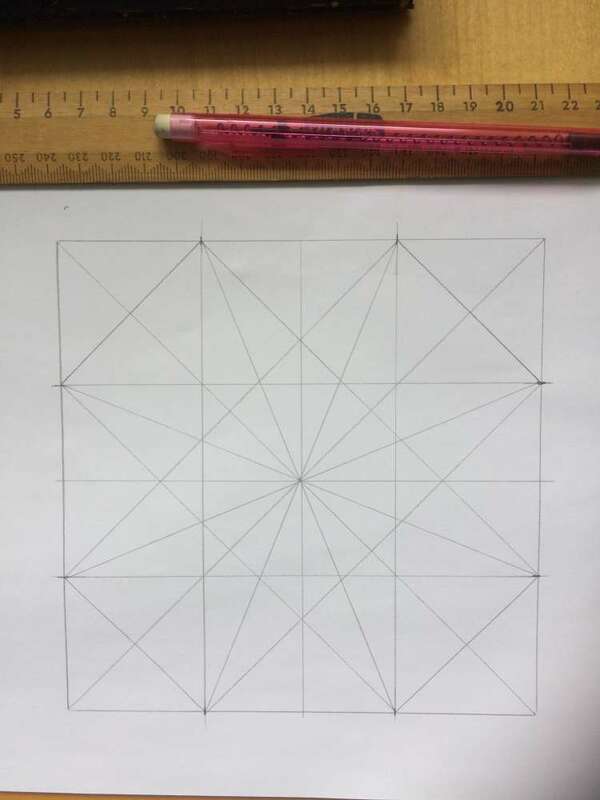 These days we can easily cut these squares, triangles and even octagons with a rotary cutter – although we maybe have to do a bit of arithmetic first. Back in the days before rotary cutters we made templates – usually from card – and drew round those. Depending on the type of patchwork being done the line drawn could be the cutting line or the seam line, but was most often the seam line. The shapes were then roughly cut out, pinned together along the seam lines (matching them as carefully as possible) and stitched (usually by hand). A standard seam allowance that could be used on the sewing machine (such as the edge of the foot) made using the drawn line as a cutting line much easier – but it explains some very narrow early machine stitched seams. 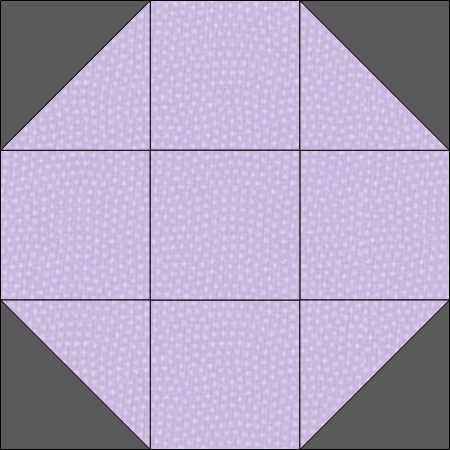 Many quilts were made from geometric tessellating shapes such as hexagons or octagons with squares and are often known as mosaic quilts.The octagon and square quilts have a variety of pattern names including Cobblestones and Snowball. So how, in the days before women received much in the way of education, did they make the templates for these mosaic quilts? The answer could be paper-folding. Quilters have long used paper-folding to design their quilting patterns so why not their patchwork patterns too? 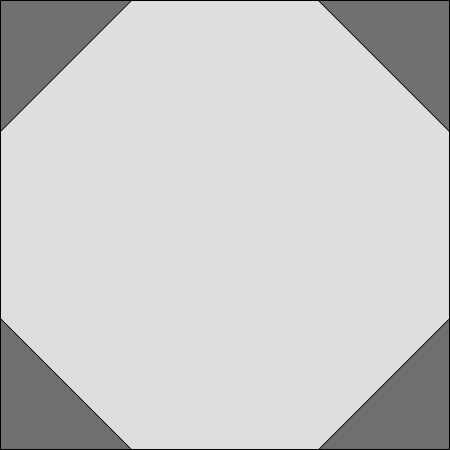 Making an octagon from a square of paper is simple and I suspect this may be how it was done. Whether the maker of the Hannah Hauxwell quilt used this method to create her template or not we shall never know. 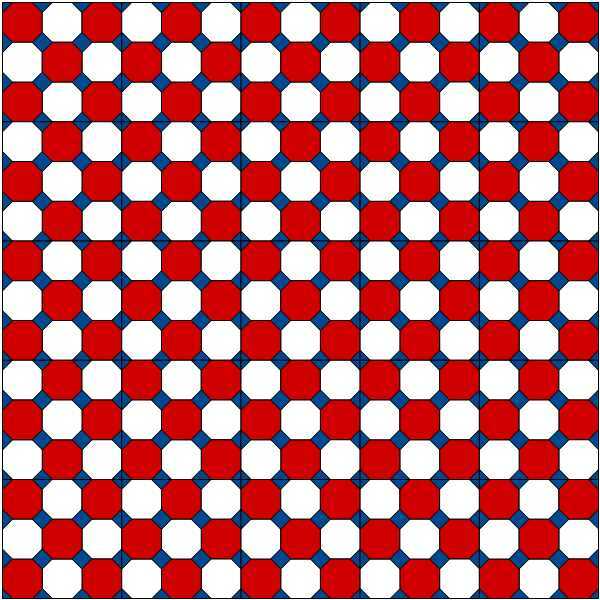 These two photos show making an octagon by folding a square of paper and drawing one starting with a drawn square. I will do another post next time about how to make templates like this but in the meantime you can download a PDF explaining both methods here. 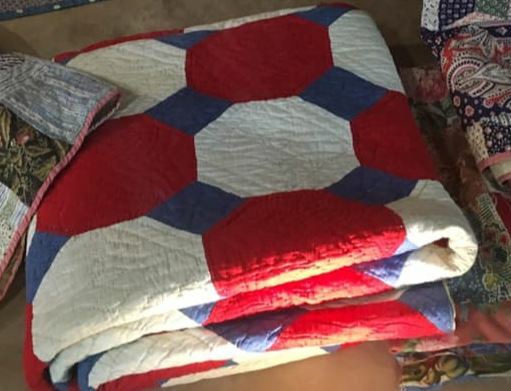 I looked online to see if I could find many more examples of vintage octagon quilts and found surprisingly few. I found a couple more old(ish) quilts online – one in the Quilters’ Guild collection and a much earlier one in the National Museum of American History. 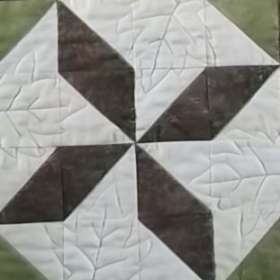 Kathy Wylie has a blog post about octagons here and the Moda Bakeshop has a free pattern to try out if you fancy taking these ideas any further. 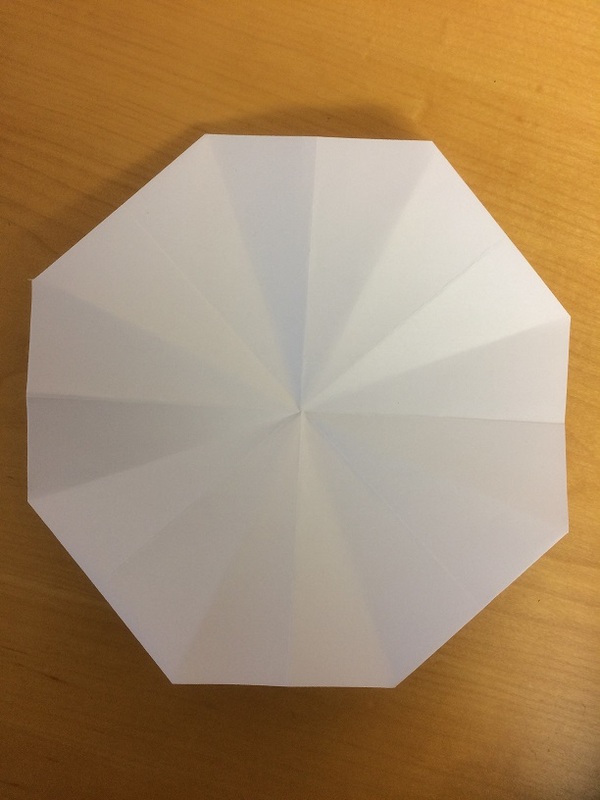 If you don’t fancy wrestling with paper-folding you can download templates (without seam allowances) for a six inch octagon and accompanying square here. I have also done templates for a 6 inch Snowball octagon which you can also download here. 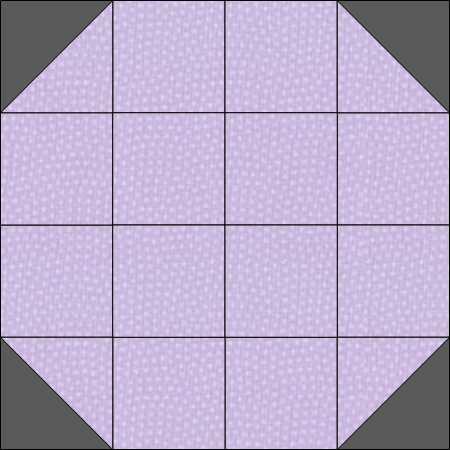 Or you can play with 9-patch Snowball blocks – I’m giving you no pattern or measurement for those as I’m sure you can work them out for yourselves although if you need help with the sums you can always download the tables for cutting squares and HST triangles from my shop (Meadowside Designs).